My name is Marco, photography and Paris are my passions. I wander through the capital city’s streets, searching for the Humans of Paris. 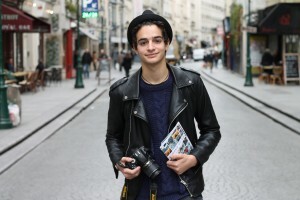 My name is Marco, and I’m 18 years old.I am the one behind the camera of Humans of Paris. Full of energy, photography has always been a passion of mine. A Parisian, I am deeply interested in the city I live in, from its architecture to its culture, its gastronomy but mostly its inhabitants. This is why, more than three years ago, I decided to start the Facebook page Humans of Paris with amongst others my friend Eytan. The purpose of the page is to make people discover the capital city through portraits of its inhabitants, and to expose their diversity : I like spending time taking their pictures but also discussing with them. 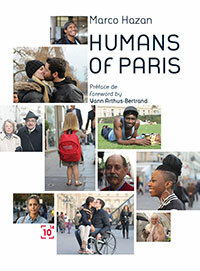 Parisians tell me anecdotes, stories, share with me a moment or a thought, or give me their “thing to know and do” in Paris… It is this sharing attitude that I want to put forward in the book, all along its 450 carefully selected pictures. Humans of Paris is more than just me : it also is Eytan, Alain-David, Thierry, Alex, Camille, Alice, Summer and a whole community – you ! – which has been supporting us for more than three years. The publishing house Cent Mille Milliards has supported and encouraged me. The book exists thanks to them. 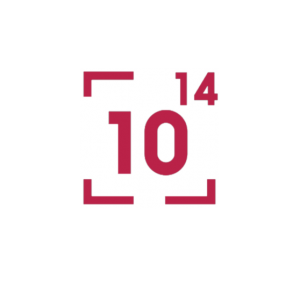 Cent Mille Milliards is a young publishing house looking towards the future of the craft. All its books, apart from a few exceptions where going digital would lessen the content, are available in ebook format. It has a keen interest in on-demand printing, that solves a number of issues in a slighlty antiquated business model, and in crowdfunding, an excellent way to involve the author’s community into his projects. Its catalog offers a wide variety of books, from cooking to novels, short stories, societal and spiritual discussions… An eclectism reflected by its motto : “one never has enough”.